End Business As Usual: It's Not Enough To Have Customers. It's Another To KNOW Them. 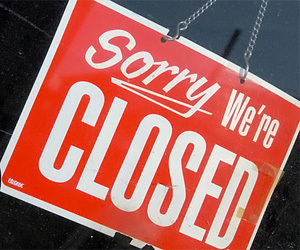 End Business As Usual: It’s Not Enough To Have Customers. It’s Another To KNOW Them. How do you view your customers? Do you go around and create print ads, schedule media buys, develop websites and hope people will buy your products? Are you going out of your way to figure out what the trends are and are you evolving with them? If not, then you’ve already doomed your business to failure – or at least stagnate its growth. The marketing world has long been focused on selling and influencing the way their products and information are being sent out. Long has this been the modus operandi for this industry and eventually you just grow suspicious about the motives of advertisements and pitches that come your way through the television, radio, newspaper, and even online. Businesses shouldn’t be continuing this line of marketing. It’s no longer about sell, sell, sell…it’s more about building trust and forming relationships with your customers and encouraging them to try out your product. 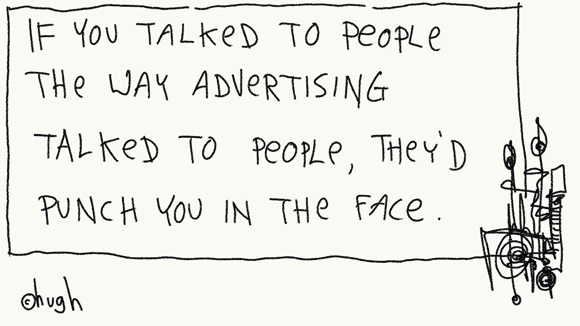 Are your customers being ignored by brands? Are marketing strategies taking into consideration the power of Word of Mouth 2.0? Sorry, but this is all the way of the past. Something has to change. A couple of weeks ago, I got one of the first copies of Brian Solis’ (@briansolis) new book The End of Business As Usual. The premise behind his next book is to help businesses and brands “rewire the way you work to succeed in the consumer revolution“. Yes, there is a consumer revolution. It’s the age of what is known as the socially connected consumer — someone who is known to be technology savvy, agile at using social networks to share information with their friends, and knowledgeable in reaching out to the Internet for insights and advice on products and brands. Think about it: as a customer, when you’re thinking about buying something, where would you go to find recommendations on the best item, price or service? Traditionally, one would probably have gone to a catalog or went to a nearby store if they wanted to buy an item. But these days, customers have a plethora of opportunities. They can go to review sites, find used prices easily on Craigslist, compare prices using a single application, or buy in bulk for much lower prices. The opportunities are endless and this is causing brands to worry – and even some to shut down. We are not seats or eyeballs or end users or consumers. We are human beings — and our reach exceeds your grasp. Deal with it. That’s exactly how we need to treat customers. We need to treat them as human beings and not just as something that contributes to our brand’s return on investment. It goes to what Mr. Solis covers in his book. It’s more about understanding the sociology of your audience and getting to know their behaviors and thoughts instead of marking them off as a statistic. We all know about the saying that it takes several good things to get people to be fans about you, but it only takes one bad thing to make them turn on you. Obviously I’ve paraphrased that a bit, but the meaning still holds true. How you interact with people using the tools at your disposal, whether it’s in person, over the phone, by email, or through the Internet via tweet, Facebook, message board, blog, etc., can be a positive or negative boon to your reputation and standing in the community. In fact, Mr. Solis points it out in one of his chapters with the title “Your Audience Is Now an Audience of Audiences with Audiences”. People are keen and interested in sharing their experiences not only with their friends and family, but also in real-time. To exacerbate it a further, those same friends and family will share it virally themselves causing your experience to snowball and grow into something massive. If you had a great experience with an airline, for example, then you’ll want to tell everyone in real-time about it. That will grow and grow and more people will want to follow that brand and learn more. But, the reverse can also happen. Remember the band that crafted “United Breaks Guitars“? That was a negative experience with United Airlines through a video on YouTube and has since viewed over 11 million views – not something you’d want to ignore and brush off…and the company acquiesced and finally started to talk and resolve the matter. 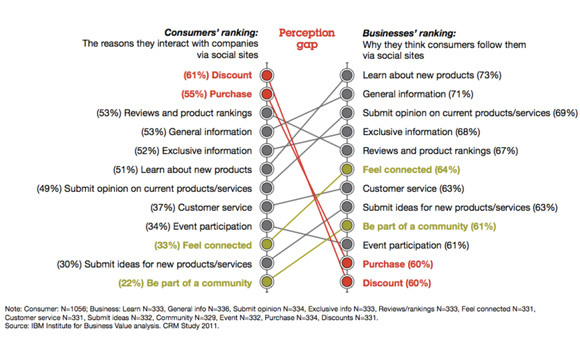 In February 2011, IBM’s Institute for Business Values did a report on the perception gap that businesses and consumers have when dealing with social sites. Just what was the motivation for consumers to follow brands on social networks and what did brands think about consumers who followed them? Were they the same perceptions? The above chart may just surprise you as to the motivations…61% of consumers wanted to know more about discounts, but 73% of businesses thought consumers wanted to learn about new products. What a pretty different disparity between the two. In fact, businesses thought the reason to receive discounts was the least plausible reason why someone would follow them on social sites. Are you paying attention to what your consumers want or are you focusing on what you “think” your consumers want? What does this mean? Simply put, it shows that you’re not going to have experts, real-life celebrities or professional athletes promote your products anymore. Instead, you’re going to need to pay closer attention to what your customers are saying and doing online and try and move on that action. 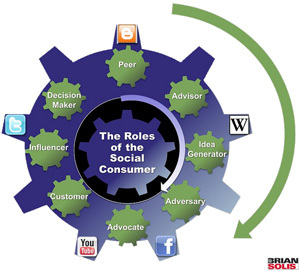 In fact, in the chart above, you can see the plethora of roles belonging to the social consumer. Mr. Solis believes that at any moment, consumers are capable of expressing any number of “faces” towards a brand. We could be a peer who might blog our thoughts to share with friends, advisor, idea generator, adversary who might be a competitor, advocate, customer, influencer, or ultimately a decision maker. There are many roles and it’s the job of the brands to realize this and build relationships with these individuals. Get into the minds of your customers. Understand how a change in your company’s culture is essential to empower success. What Mr. Solis offers in The End of Business As Usual are conceptual and strategic advice on knowing thy audience. But while it may seem verbose at times, what you will find helpful are case studies and language that will make it easy for you to translate into your own business. This isn’t a 101-level course book on how to use social media or a book on Internet marketing – we’re way past that. 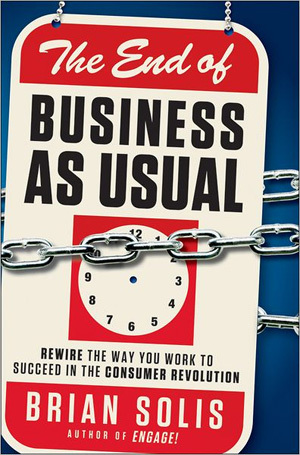 And while Mr. Solis’ last book Engage was more about the phenomenon of getting yourself out there to talk to your clients, The End of Business As Usual takes it one step further by looking at the cultural shift in business and takes it to a more conceptual and theoretical vantage point. Something is definitely happening in the world of business…it’s no longer about things revolving around the company. Rather, it’s about making your business work around your customers. The customer may not always be right, but they are always on and can affect you in more ways that you can imagine. By reading this book, you’ll be able to inch your way into the consumer revolution and be better skilled at making them happy. From research to listening to engagement, brands will be able to leave traditional marketing ideas in the past and jump right into the new paradigm: you’re dealing with human beings and they’re not at your beck and call anymore.